When I was twenty-four, I knew virtually nothing about business and less about banking. I had very limited self-esteem and assumed that, if someone was wearing a suit, he knew what he was doing and I shouldn’t question him. That was in the early 1970s and bank rates were phenomenal. I had chosen the bank due to the fact that they were paying 11.5%—more than anyone else. One day, I decided that it would be prudent to visit the bank and meet the manager. When I went in, there were quite a few young pretty women walking around in designer outfits—something I’d never seen in a bank. One of them said I couldn’t see the manager right away, but she showed me to a leather sofa and offered to bring me a drink. I’d never heard of a bank serving alcoholic beverages, but it made me feel a bit special to sit on the nice sofa and have a rum and Coke. 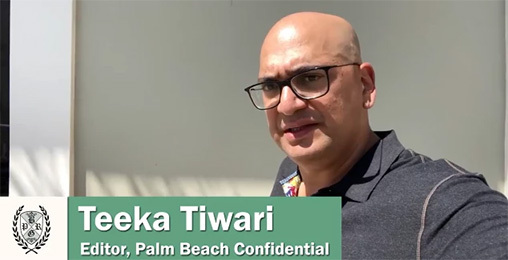 However, Teeka believes those who get in now – before an imminent deadline – could make even more money this year. Click here for all the details. She looked a bit nervous and asked me to wait just a moment while she got the manager. She returned a few minutes later and said that he’d see me now. I was brought into the manager’s office who smiled, shook my hand and asked if I had any questions regarding my account. I said, “No, I’ll be withdrawing all the money now.” He pointed out that that would be a mistake, as, in a few weeks, I’d be receiving my quarterly interest and it would be better to leave the money in the bank. He stated that what I was requesting was unusual and that, in any case, he was unsure if a clerk was available to provide me with the withdrawal at that moment. He then lost the smile and told the young woman to bring in a statement of account. We agreed on the balance and I was paid out in cash. In 1 day, this gentleman almost lost his entire $1,000,000 life savings. But by using his “secret key” technique… he saved all his money… generated a fortune… and got to retire at 42, with more security than he'd ever imagined. The most surprising part? His “secret key” wasn't a one-time tactic… he's been quietly using it for the past 26 years to make millions. Click here and see his “secret key” in action. Two weeks later, the bank closed its doors and an announcement was later made that it had gone into liquidation. The directors had left the country. The liquidators charged exorbitantly for their work and took a full five years to perform the liquidation. When they were done, the depositors received less than 5% on the dollar. So… this may be only a moderately entertaining story, but I learned a major lesson from it. I was just a young no-account, who was entirely unqualified to judge those “in the know.” But my instincts told me that this was no way to run a bank. Of course, the hook here was that, in a few weeks, I’d be getting that fat interest payment. If I could just be reasonable and wait until then, I’d be getting my hands on more money. Surely that was worth waiting for? No, it wasn’t. In fact it almost never is. When your gut tells you that a situation has turned sour, it doesn’t matter if it sounds like the best deal in town. The smart move is to get out—immediately. Don’t wait for the alleged payoff—accept your losses and run. Throughout my life, I’ve been fortunate that this lesson has stuck with me and, although I’ve missed out on the occasional good deal, I’ve avoided far more bad ones and, on balance, I came out way ahead. Unfortunately, though, we’re trained to follow the accepted path. As an advisor, I frequently meet Americans who are counting on their 401k’s to provide for their retirement. My advice to them is that their 401k’s are invested in stocks, which are overdue to go south, so it’s better to get out now. They invariably say, “But if I do that, I’ll pay a 10% penalty.” My advice is to take the hit now to avoid a bigger hit later. But many, many people cannot bring themselves to face a small loss in order to avoid a greater loss—they blindly follow the “bird-in-the-hand” concept. Similarly, these same people often say that they don’t need to create a better economic future for themselves, as their pension will cover their needs. Unfortunately, treasuries may be hit even harder than the stock market in the coming crisis. Unfortunately, these rejoinders are extremely flimsy at best and economically suicidal at worst. When a crisis is imminent, it’s every man for himself and he’d better learn to rely on his instincts and create an alternative plan, or he’ll be going down with the ship. The significance of this is that, although your banker, broker and all the “experts” on TV news programmes may advise you to accept the status quo without question, you unquestionably should, first, question everything and, second, listen to your gut. Those who remain reliant upon banks, governments, pension plans, the market, etc. to save them during the coming crisis, will very likely become casualties. Those who take a contrarian approach will have no guarantees, but will have greater odds of survival, through diversification out of conventional investments and problem jurisdictions. Editor’s Note: Bank closures are a telltale sign of bigger problems ahead. Fortunately, there are practical ways to prosper despite a crumbling economy. Find out how in our Guide to Surviving and Thriving During an Economic Collapse. Editor’s Note: Imagine going to the ATM and nothing comes out. You know your account balance. You know you entered the right PIN. But still, nothing… This is exactly where America could be headed—and soon. Investment industry icon Bill Bonner explains how it could all play out in his new book, When the ATMs Go Dark. Click here to claim your copy.